From left: Sierra 175-grain GameKing, Hornady 175-grain ELD-X, Barnes 175-grain LRX, Berger 180-grain Elite Hunter, Nosler 200-grain AccuBond. Two criteria define bullets designed for hunting big game. The first is terminal performance, a subjective element dependent on your specific needs. The second characteristic is accuracy, which every savvy hunter values and strives for. Over the years I’ve found five vastly different big game bullets that regularly provide outstanding precision and are relatively forgiving to handload. Here, in alphabetical order, is a look at each, with notes on seating depth preferences and on-game performance. This cutting-edge monolithic projectile features a boattail and polymer tip to reduce aerodynamic drag and to reliably initiate expansion on impact. Grooves around the shank provide room for copper material displaced by the rifling to flow into, eliminating the pressure spikes common among early monometal bullets. As a nice side benefit, the grooves benefit accuracy. However, the grooves do add a bit of in-flight friction, reducing ballistic coefficient below that of competing long-range hunting bullets. It’s a worthy tradeoff. I’ve seen many rifles shoot half-m.o.a. three-shot groups consistently with the LRX. Because it’s a dense bullet, the LRX shouldn’t be seated against the rifling. It needs a bit of jump to take the rifling without creating a pressure spike. Thankfully, jumping the LRX .020 to .10 inch tends to benefit accuracy. Barnes recommends .050 as a good starting point when working up a new load. While the LRX doesn’t provide quite as many lightning-like kills on thin-skinned game as softer bullets do, it’s one of the finest all-around hunting projectiles available—providing reliable, impressive expansion and best-in-class penetration. It’s my pick for a one-load bullet to be used on everything from Coues deer to moose. Berger’s relatively new Elite Hunter is basically a refinement of the firm’s VLD Hunting bullet. The ancestral VLD Hunting has an extremely aerodynamic secant ogive, which is picky about seating depth. Berger engineered the Elite Hunter to retain excellent ballistic coefficients but be less sensitive by incorporating a hybrid shoulder that combines a long sleek nose with the more forgiving shoulder of a tangent ogive. It has a soft lead core inserted into a thin, non-tapered, ultra-consistent Berger jacket cup and swedged to shape, to include a generous boattail. Best performance is commonly found somewhere between kissing the leade and .015 inch off. On impact, the Elite Hunter tends to penetrate one to four inches and then expand violently, in many cases rupturing like a varmint bullet into fragments. This is its weakness; it can fragment before reaching the vitals, creating a nasty crater but not killing cleanly. This typically occurs on quartering shots. You’re best off holding out for a broadside shot with this one. Engineered to be the best all-around extended-distance hunting bullet available, the ELD-X arguably achieves its goal. It’s a boattailed, high-BC projectile featuring the company’s proprietary Heat Shield tip, which resists BC-degrading erosion at extreme velocities. An interlocking ring helps contain the core inside the tapered jacket. I’ve rarely seen a rifle that won’t provide excellent accuracy with the ELD-X. Interestingly, the bullet tends to prefer single-base propellants, which sometimes don’t provide quite the velocity that double-base gunpowders do. That’s okay: ELD-X bullets have such good BCs that maximizing muzzle velocity isn’t as important. I typically start with the ELD-X seated against the rifling leade, and work off in increments of .005. Best accuracy is often found right against the rifling, but many rifles prefer a small jump of .015 or so. On impact the ELD-X expands dramatically, usually shedding considerable weight. The tapered jacket and interlocking ring tend to slow expansion and create a really nice mushroom, particularly at slower impact speeds. Frequently, the bullet is found against the offside hide, and often the core is separated from the jacket but lodged within an inch or two. A candidate for best all-around hunting projectile, the AccuBond features a moderate boattail that exits barrels consistently, a polymer tip that aids aerodynamics and a soft lead core bonded to a robust tapered jacket. Nosler is able to bond this bullet’s core to the jacket without introducing accuracy-robbing inconsistencies. I’ve seen many custom rifles produce half-m.o.a. groups with the AccuBond, and at least some of this is courtesy of the design’s less-than-aggressive tangent-ogive nose profile, which takes the rifling very well from a broad range of seating depths. 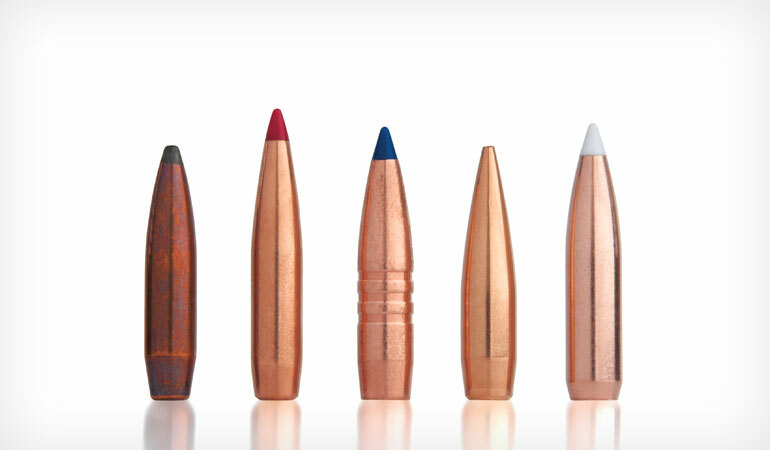 The AccuBond is a rather dense bullet, and lower pressures are incurred with a bit of jump to the rifling. I’ve seen rifles that shoot it beautifully seated 0.1 inch or more from the leade. Ballistic coefficients aren’t spectacular but are entirely adequate to 600 yards or so. On impact the AccuBond mushrooms fast and big. Because the core is soft lead—a requirement of the bonding process—rather than the harder alloy commonly used in non-bonded big game bullets, a considerable amount of it typically “smears off” as the bullet travels through the vitals. The fragments spiral away from the primary projectile, creating additional trauma. Usually, the expanded bullet retains 40 to 70 percent of its original weight and either exits or is found against the offside hide. This is the oldest of all the inherently accurately bullets spotlighted here. I began handloading the Game­King for use on mule deer when I was 18 and discovered its superbly consistent, forgiving traits. It’s not particularly advanced in terms of technology—a simple lead tip, gentle tangent ogive and boattail—but it’s so consistent it’s still one of my go-to bullets when I need real precision. Plus, it’s been around so many decades that just about every useful weight/caliber configuration is readily available. On the downside for some people, the GameKing doesn’t offer competitive BCs for extended-range hunting. Typically, the GameKing is absurdly forgiving in terms of seating depth. I’ve often found bullets can simply be seated to fit and feed from the magazine and, assuming a premium barrel, provide eyebrow-raising accuracy. That said, I achieve tighter standard deviations by seating GameKing bullets firmly against—but not engraving into—the rifling leade. On impact the GameKing tends to expand dramatically, shedding some weight off the forward end of the alloy lead core. The tapered jacket then slows expansion, resulting in a picture-perfect mushroom shape unless heavy bone is encountered. Sometimes—but not commonly—the core and jacket separate, but I’ve never seen the GameKing fail to kill cleanly. However, the GameKing is not my first choice on large game with heavy muscle and big, dense bones, such as moose and bison. For deer-size game inside a quarter mile, it’s ideal.